Home / Don't Miss Sunbird at Data Center World Global! Don't Miss Sunbird at Data Center World Global! 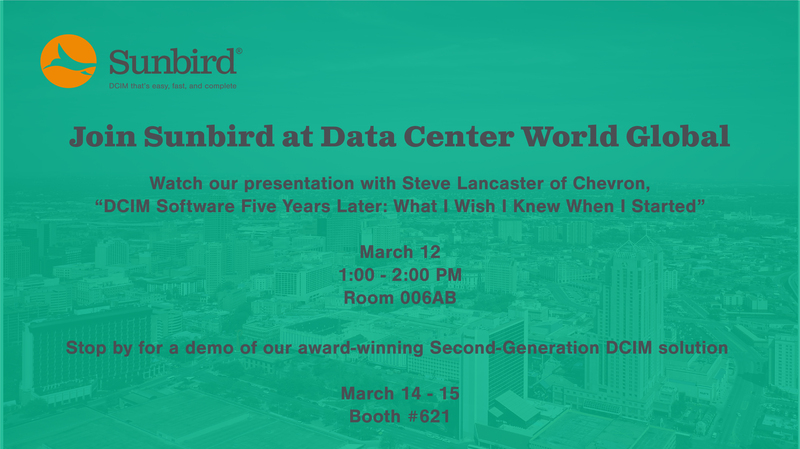 Sunbird will be presenting a customer case study with Chevron at Data Center World Global 2018 in San Antonio, TX from March 12-15 at the Henry B. Gonzalez Convention Center. You won't want to miss Steve Lancaster, Chevron DCA Facilities Lead, present key learnings from five years of using Sunbird's Data Center Infrastructure Management (DCIM) software solution in Chevron's data centers. Sunbird's own James Cerwinski, Director of Product Marketing, will be facilitating this interactive discussion. Steve has more than 18 years of experience in managing data centers and providing IT support. Steve has worked at Chevron for four years with primary responsibility for developing the San Antonio data center from the ground floor into an enterprise level, highly redundant modern data center. Steve has recently relocated to Houston, where he has responsibility for developing the Houston data center in a similar fashion. Steve is an active member of the local AFCOM chapter, where he has participated on many panels discussing data center infrastructure topics. Whether you're an experience DCIM software user, just starting out, or are still looking for a solution to use in your own data center environment, this presentation is sure to be a useful and relevant learning opportunity. In this case study presentation, Steve Lancaster, DCA Facilities Lead at Chevron, will share knowledge gained and lessons learned from using DCIM to successfully optimize Chevron’s 1300+ rack data center environment. Lancaster will discuss critical aspects of his DCIM journey, including what he was looking to achieve with a DCIM solution, and how he is using DCIM today to monitor data center activities and make smarter data center management decisions. He’ll also explore how collaborating with a trusted advisor helped him achieve his objectives, areas where he expects to expand this use in the future, and what he wishes he knew when he started. At Data Center World, you’ll join 1,000 Data Center, Facilities, and IT Infrastructure Professionals. Data Center World draws upon the knowledge and experience of the more than 3,500 AFCOM members to create an end-user driven agenda that focuses on real solutions for today's key challenges. Don’t miss this opportunity to network with like-minded professionals, get real-world tips from experts, and explore how Sunbird can help you simplify your data center management. Learn more and register here. Sunbird is also excited to be exhibiting at Data Center World! Make sure to stop by Booth #621 in the exhibit hall for a demo of our award-winning Second-Generation DCIM solution. Heading to Data Center World and want to chat one-on-one with a DCIM expert? Sunbird representatives will be available for individual meetings. Let us know if you’d like to meet.